Microblading is an advanced brow technique that uses a superfine row of needles to deposit pigments into the skin to create thin, hair-like strokes. 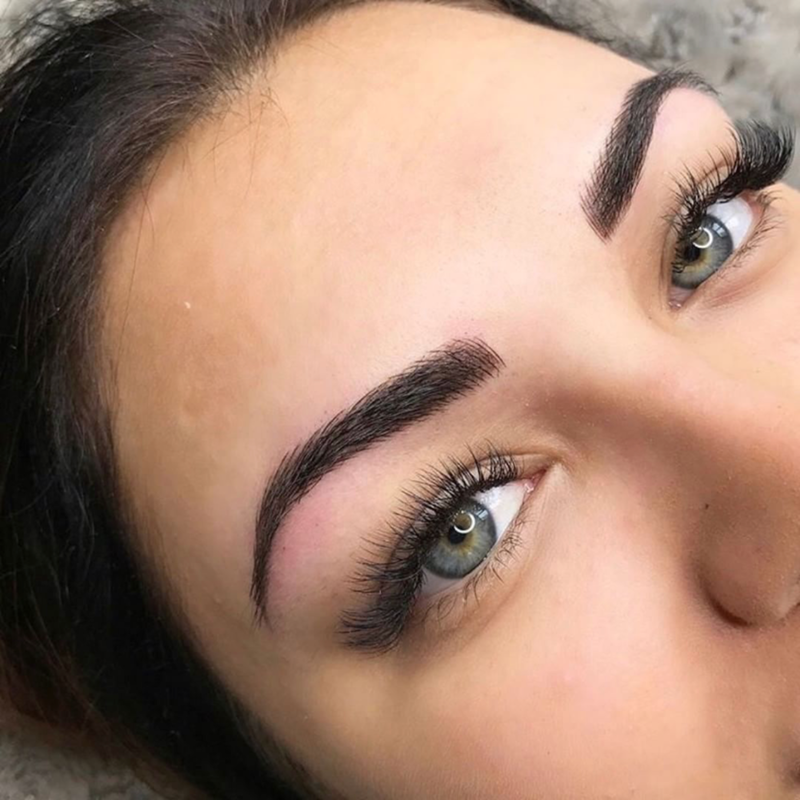 Microblading is ideal for creating a very full and realistic looking brow, and is becoming an increasingly popular method in permanent makeup. During the treatment, after a brow consultation, the new brow shape outline is penciled on, the brow area is numbed, and then pigment is implanted into the epidermis skin layer. This is done using very tiny needle strokes. These are built up into the new shape, and the area is gradually made denser with lots of tiny hair strokes, depending on the desired result. The Phibrows technique we practice gives our clients amazing results, as they are in the hands of a truly skilled artist. If you want effortlessly gorgeous brows, contact us today to set up a consultation! During your consultation we will work together to discuss your goals, preferences, shape of your brows and the problem areas you wish to address. We will also discuss the effect you wish to achieve and your preferred brow shape and design. We can advise and inspire and show examples of brow shapes which will work with each clients face shape and brow type. We will also talk about any questions or concerns you might have. If you have any concerns, we will be happy to address them and help you decide on a treatment plan that will work for you. Don’t wait any longer to get the beautiful brows you’ve been dreaming of! For consultation fee information, please follow the link below. STEP 1 Microblading Session: The initial procedure takes approximately 2-3 hours. During this time, we will discuss your desired brow look, choose a color and draw the initial outline of the procedure area for your approval. Though our faces are NOT perfectly symmetrical (one side is usually flatter than the other), we do our very best to create as much symmetry as possible! As we like to say BROWS ARE SISTERS, NOT TWINS. Once you are satisfied with the basic shape and symmetry, the area is then traced over and pigment is applied with a disposable microblading hand tool. This procedure uses a manual hand tool and not a machine. STEP 2 Perfecting Touch-Up Session: The second stage of the treatment is a Perfecting TOUCH-UP appointment. The touch up that takes approximately 1.5 hours. Touch ups are done no earlier than 4 weeks after your initial procedure and no later than 6 weeks. If you do not schedule your touchup within 4-6 weeks of your initial session, you will be required to pay an additional fee. It is IMPERATIVE you complete the perfecting touch-up treatment. Without it, the results will not be optimal. Color will fade significantly within 4 weeks as the skin heals, peels and fades. Combining microblading strokes and shading! We add strokes to the brows (manually and/or with machine) and then in-between the strokes themselves, we add shading. Usually this is done at and after the arch. Please refer to the above information on general microblading. For cost information please refer to our pricing page. This is a semi-permanent process. It will fade over time, to varying degrees. A touch up or "ENHANCEMENT SESSION" is recommended at least once every year to keep brows looking their best. Please check my pricing page for my most current touch up cost for regular clients! Eyebrow microblading goes by a few different names like, microstroking, micropigmentation, eyebrow embroidery, eyebrow feathering, and 3D eyebrows. The procedure of microblading eyebrows is relatively new here, but it has been popular in Asia and Europe for roughly 25 years. Every client's skin responds differently to these treatments, and the information acts as a guideline only. In order to achieve the best possible outcome of your newly microbladed brows, it is crucial to follow the aftercare directions that you are given at your appointment. Are You Ready for Perfect, Worry-Free, No Hassle Brows? Book an Appointment Today!